China’s growing trade and investment in South Asia have caused several concerns in India, with fears of encirclement on the rise, especially post the Chinese takeover of a 99-year long lease of the Hambantota port in Sri Lanka. China’s economic prowess has been the reason behind its increasing teeth in international relations, and this is visible even in South Asia. The primary reason behind China’s arrival at the world stage as an economic powerhouse has been its export-led growth strategy, which was enabled by globalization. However, China has utilized trade and investment not just as tools to strengthen its own economy but also to gain a strategic edge in international politics. While most of China’s trade depends on the comparative advantage it has, what is also pertinent is that China’s trade is not just economic in nature, and beyond comparative advantage, it moves to the realm of strategic trade. 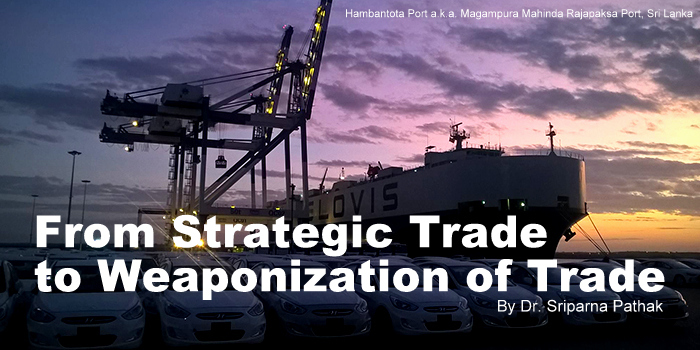 In the case of its trade with South Asian countries, what is also seen is a "weaponization" of trade. A clear example of this lies in China’s economic linkages with South Asia. China’s trade with the eight South Asian countries of India, Bangladesh, Nepal, Bhutan, Sri Lanka, Maldives, Afghanistan, and Pakistan respectively is all titled in China’s favor. India remains the largest market for China in South Asia. The persistent trade deficit for India has existed for over a decade, and it was only in 2017 that there was a marginal reduction in the deficit from the US$ 52.69 billion in 2015-16 to US$ 51.08 in 2016-17. The story is the same for Pakistan and Bangladesh as well. For Pakistan, its trade deficit with China increased from US$ 4.032 billion in 2012 to US$ 12.67 billion in 2016-17. In Bangladesh’s case, in 2017, the Prime Minister’s Office instructed the commerce minister to implement initiatives to reduce the trade deficit with China. The highest trade deficit Bangladesh has with any country is that with China and the amount stood at US$ 6881.47 million in 2017. The noteworthy fact in all these three countries’ cases’ trade with China is that all have agreements to increase their respective products’ presence in the Chinese market. Examples from India include a series of Memorandums of Understandings (MoUs) signed with China to allow more IT services, pharmaceuticals and bovine meat from India to enter China. However, even in products in which India has a comparative advantage, there exists tariff as well as non-tariff barriers (NTBs) for them in China. It takes about five to six years for even the longest established Indian Pharma firms to register their products in China. For Indian IT services, on the other hand, there exists the opaque Chinese state-controlled and state-owned enterprises, which makes breakthrough close to impossible. In the case of agricultural commodities like oilseeds, for example, as many as 11 certificates are needed stating the items are pest free. Ironically, 10 of the 11 pests mentioned already exist in China. Therefore, the weapon used to barricade Indian products for example in Chinese markets is that of NTBs. Another example of a product where trade is used for means other than economic is that of non-Basmati Rice. While China remains one of the largest buyers of non-Basmati rice from Pakistan, it does not allow such supplies from India. Despite the agreement from the Chinese side in 2016, the rules are such that authorities will first visit every rice mill in the country before allowing the shipping out of the products, and while India has been requesting China to expedite the entire process, it has been six years without avail. Clearly, the strategy being used to in this case is a weaponization of trade. The concept of weaponization of trade, propounded by Rebecca Harding and Jack Harding in is one in which trade is used as a tool of coercion to achieve strategic influence, and trade becomes an instrument of foreign policy. Brahma Chellany, using it in the context of China, wrote that the Chinese government encourages and exploits states’ economic reliance on it to compel their support for its foreign policy objectives. It even uses economic punishments in the form of restricting imports of boycotting goods from targeted countries. Examples are myriad in the form of China’s blockage of exports of strategically important rare earth minerals to Japan in 2010 over a diplomatic spat over the Senkaku Islands to the imposition of punitive fees on Mongolia in 2016 for its commodity exports for hosting Dalai Lama. In the case of South Asia, the economic reliance is stark and the trade deficit which gets used as a weapon by China is visible in the graph below. As seen in Graph 1, the trade deficit with India stands out as the highest among all the South Asian countries. The fact to reiterate in this context is that China’s trade with India is the largest in South Asia, in addition to the fact that the Indian market is much larger than the markets of the other seven South Asian counties. The only country, the trade deficit of which with China has slightly reduced in the mentioned time period is that of Nepal. However, the deficit remains. Large volumes of Chinese exports in comparison to imports from partner countries is a constant for all the eight South Asian countries, and this is done to achieve the purpose of strategic trade. As seen in the case of non-Basmati rice exports from India, China prioritizes the imports from its all-weather friend Pakistan, over and above India, with which it has agreed and consciously forgotten to import the product since 2016!The concepts of strategic trade and the weaponization of trade are closely related. Only after trade can be established as strategic trade, can it be used as a tool of foreign policy to penalize states economically, leading to what is the weaponization of trade. The modern understanding of international trade, facilitated by the flows of globalization is largely based on the principle of comparative advantage as developed by David Ricardo. In the early 1980s, James Brander and Barbara Spencer came up with a new trade theory which provided at least limited support for a kind of neo-mercantilism, implying that governments could raise national income at other countries expenses by supporting national firms in international competition. This new trade theory came to be known as the strategic trade theory. This has been the exact model behind China’s export-led growth strategy, and as seen in the NTBs that are faced by Indian products for example or even the subsidies provided to Chinese firms by the government, China has indeed turned a trade into the strategic trade. The subsidies provided by the Chinese government enabled firms to engage in manufacturing at massive scales, leading to an oversupply of goods in turn-which was then exported to other countries, including the South Asian ones. As seen in the case of its trade with South Asia, and the dependence it has created, in the near future, a weaponization of trade, wherein China can use its economic leverage to gain strategic leverage in South Asia is not difficult to imagine. China already has gained the control of the strategic Hambantota port in Sri Lanka through its debt trap diplomacy, and even though Sri Lanka has stated that it will not allow it to be used for military purposes, in all probability, given that strategic trade has already been established by China; and Sri Lanka is dependent on China for a plethora of goods, a weaponisation of trade is possible in the near future. A similarity is seen in Pakistan’s Gwadar port which has been leased to a Chinese company for 40 years. The same is the case with the other South Asian countries. Unless the countries in South Asia are able to reverse the trend from being one of strategic trade to trade based on comparative advantage, an inevitable utilization by China of bilateral trade to suit its own strategic interests is not far away.